Abakus is a simple calculator for KDE, based on a concept of Roberto Alsina's. Think of it as bc (the command-line calculator) with a nice GUI. Abakus wasn't the only calculator to be developed due to Roberto's brainstorm. You may also want to try Ariya Hidayat's SpeedCrunch (maintained/improved by Johan Thelin). In fact many of Abakus's user interface niceties were donated from SpeedCrunch. Important note: Although I actually still use abakus from time to time, it has fallen far to the back of my list of "maintained software packages". I have uploaded a version (0.92) that builds for KDE 4 based on occasional requests I receive by email, but you should consider feature development stopped for now (unless someone else picks it up). For instance, I have not updated the screenshots (not that it's substantially different now). Better KDE 4 support, including use of the standard KDE 4 build system. Includes an RPN mode for old-school calculator users. Includes a scrollable history window, which can be hidden for compactness. When the history pane is hidden, results are shown directly in the edit line. Previous expressions can be entered using the up and down keys. 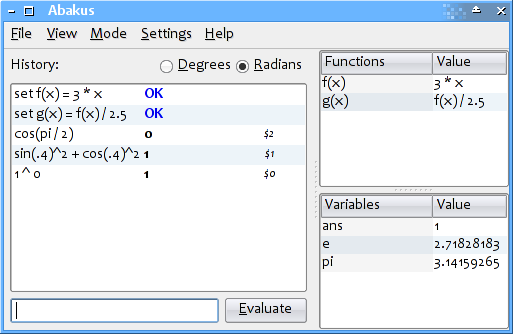 Built-in functions, including a full suite of trigonometric, logarithmic, and exponential functions. Fully supports KDE, so it supports KDE features automatically, including some automatic DCOP support. The calculator supports using variables (which are saved between different runs). Includes predefined values of pi and the natural exponential base (e). The last successful answer is stored in the variable ans. Compiled in C++ for fast startup speed. Both ^ and ** are supported for exponentiation. Exponentiation is (correctly) right-associative. What this means is that 2 ^ 3 ^ 2 returns 512 instead of 64. Expressions like 3 + -2 are accepted, instead of requiring a separate sign-inversion symbol like the TI family of calculators. You need flex and bison installed to build the program, as I've not included the generated sources with the package. On the other hand, although the MPFR library is (still!) supported, it is not required.